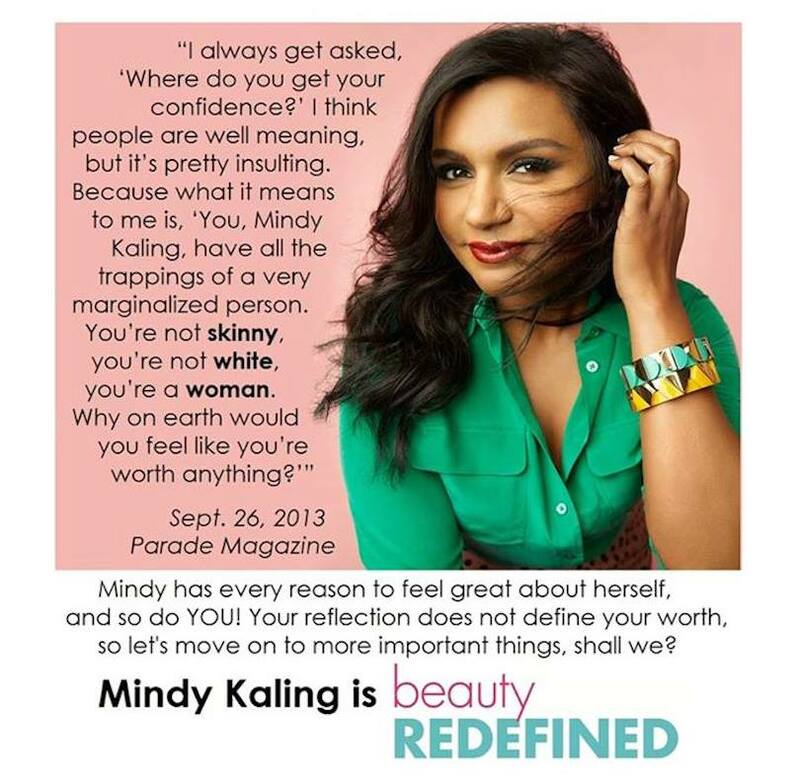 Mindy Kaling tells it like it is. I adore the show The Mindy Project, I really do. It’s my little happy place for 22 minutes each week, not only because the writing and comic delivery of the actors is phenomenal, but also because I see a part of me in Mindy. Her character is exaggerated but I think a lot of women can identify with what Mindy struggles with, and have felt what she feels at least at one point during their lives. The show touches on mismatched relationships, hope for love, body, gender, and race issues, and quite frankly, just trying to move through life each day without acting on the desire to facepalm your way through every moment. If you’ve seen or read interviews with Kaling, you get the impression that there is quite a lot of herself mirrored in her show character. I know that it’s no surprise that in 2013, women are still so intensely dealing with the feelings of marginalization that she refers to in her quote above but…well…I’m kind of surprised. I mean, we’ve been internalizing positive messages of body, race, and gender diversity for so many years now, why has diversity not just become the norm? The answer is that we’re contending with many, many decades (actually, centuries) worth of deep-seated ideals that require many, many Mindys to wash away. I’m not just referring to Mindy Kaling’s but to the Mindy in every single one of us. The responsibility for nullifying negative stereotypes and judgements starts with US. Have you ever noticed that people are so very offended when they are judged but they are more than happy to turn around and judge someone else for either the very same thing or for anything else under the sun? I mean, really?? The cycle just continues that way and we all need to understand that. I look with my heart.